Jaskirat Singh Sidhu will appear in Provincial Court in Melfort on Tuesday, July 10, 2018 at 9:30 a.m.
Sidhu is facing 16 counts of dangerous operation of a motor vehicle causing death and 13 counts of dangerous operation of motor vehicle causing bodily injury. 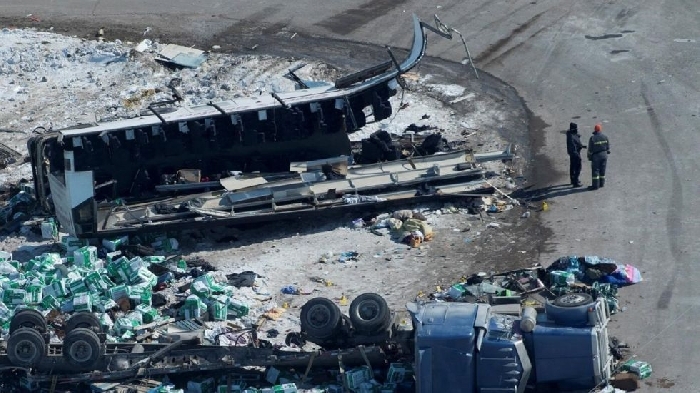 Sidhu was working for the Calgary-based Adesh Deol Trucking Ltd. when the crash occurred at a rural intersection. He was heading westbound on Highway 335 in a semi as a Charlie's Charters bus carrying the Humboldt Broncos was travelling northbound on Highway 35 to an SJHL playoff game in Nipawin, Sask. The bus had the right of way. There is a flashing stop sign for drivers on Highway 335 at Highway 35 between Nipawin and Tisdale. The RCMP said the semi was in the intersection when the bus crashed into it. Sidhu was detained after the April 6 collision then released. He was uninjured. Sidhu worked for the trucking company for one month prior to the fatal collision, according to owner Sukhmander Singh. Singh said Sidhu trained with him for two weeks and was driving on his own for two more weeks before the crash. The Saskatchewan Junior Hockey League's Humboldt Broncos were heading to Nipawin for a playoff game when the collision occurred. Ten members of the Broncos died. The six other deaths included the bus driver, an athletic therapist, the head coach, assistant coach and two employees of Humboldt's FM radio station.